Proudspire Manor is a three-story house that can be purchased in Solitude. This manor is the most expensive house available for purchase in Skyrim. It has many amenities available for purchase, including an alchemy lab, an arcane enchanter, and cooking pot for your crafting needs. To purchase the home, you must first complete the two quests The Man Who Cried Wolf and Elisif's Tribute. Upon completion, Elisif will permit you to purchase the house from Falk Firebeard for 25,000 gold. Ownership of this home and helping five citizens within the hold is required to become a thane of Haafingar. Jordis the Sword-Maiden is the housecarl of Proudspire and joins you after you become a thane. ‡ This person moves here once you have purchased the property and become thane. It is located between the Bards College and Vittoria Vici's House and is near the Blue Palace. There are a number of harvestable plants outside, including dragon's Tongue plants, hanging moss and blue mountain flowers. There are three entrances to the manor; one provides direct access to the basement and crafting stations while both the other entrances lead into the second floor and the main reception area. Once purchased and prior to purchasing any of the upgrades the property is far from empty. It is dirty and dusty with cobwebs throughout. However with the exception of four food barrels, five food sacks, two cupboards in the basement, a food barrel in the reception area and the child's bedroomHF all other items found prior to purchasing the upgrades will also be available after the upgrades have been purchased. The upgrades improves the quality of the furniture found in the manor and adds various items of furniture, many rugs and other items of interest. Unusually, the Child's Bedroom upgrade does not remove any crafting areas, it does remove two sets of shelves holding several potions and ingredients from the upstairs private dining room. As such it is worth purchasing this separately from the other upgrades enabling you to collect the items from the shelves before returning and purchasing the child's bedroom. Climbing to the top floor leads past a food barrel and stack of crates halfway up the stairs that are removed when purchasing the living room upgrade. At the top of the stairs is a large vase containing a snowberry bush. The room has a long wooden table with a bottle of spiced wine, a bunch of tundra cotton and a potion of regeneration on top and three chairs arranged around it. There are many more crates stacked around the room which are removed and replaced with the living room upgrade. A door in the west wall opens into the master bedroom containing a large double bed coming out from the west wall with an end table to the left with a bottle of alto wine on top, a stool to the right and an unlocked empty chest at the foot of the bed. There is an unlocked safe in the corner, two small wardrobe; one of which has an unusual gem on top, narrow table, small unit, and low table and chair with a potion of regeneration on top. Here you will find a set of shelves, a low table with two chairs and a stool around it and a copy of The Wolf Queen, v8 on top. There are also a crate, food barrel, narrow table and two more chairs stacked in the corner and by the entrance from the porch area another narrow table with an iron dagger on top. The kitchen is directly off of the reception and contains a wooden table laid with two bottles of spiced wine, a potion of regeneration, three salmon steaks, a portion of grilled leeks, a seared slaughterfish steak, and a bunch of tundra cotton. There are three wall shelves, one of which has two bottles of Nord mead on, a narrow table with an iron dagger on top and a food sack underneath, a sideboard with a small mead barrel on top and two open crates, one of which is on a small set of shelves. The open crates contain a total of three bunches of lavender, two leeks and a tomato. Outside in the patio area are three food barrels and several stacks of crates. The stairs down to the basement have a stack of crates and rugs halfway down. At the bottom in an alcove on the right are a set of shelves filled with small mead barrels, a bottle of wine and two bottles of Nord mead, a cupboard holding two food sacks and some cheap crockery, and a food barrel with eight iron ingots on top. The next area, which becomes the enchanting area, contains two practice dummies, the base of an archery target, and a set of shelves holding a bunch of tundra cotton, three garlic bulbs, a gourd, a single loose septim, a set of fine clothes and a pair of boots. Past the partition where the alchemy lab is placed is an extinguished fire pit in the middle with a silver ingot on the surround, a cupboard holding several loaves of bread and cheese wheels, four food barrels behind the cupboard and three food sacks beside it and two stacks of crates including an open one containing a red apple and three potatoes. There are two stacks of two open crates by the basement entrance, the bottom crate of each contains bread and cheese and a sample of fly amanita, a gourd, a rock warbler egg, and an orange dartwing. The housecarl's room in the basement contains an unowned bed roll, two food barrels, three food sacks and many crates, rugs and unused pieces of furniture. This doesn't get upgraded like normal when you become thane and the housecarl moves into the manor, unlike with other houses. The large double bed has been replaced by a luxury four poster double bed, the end table, chest, safe and two small wardrobes remain unchanged. The stool to the right of the bed has been replaced with a small round table. The small unit has been upgraded, the narrow table now holding a platter of three sweet rolls and a plate of two green and a red apple, and low table and chair have all been upgraded now holding a plate of bread and cheese and a bottle of alto wine. Added to the room are a wash basin, a wall shelf holding a bottle of wine, a bottle of spiced wine, three bottles of Nord mead, two weapon racks, and a two-shelf bookcase with a bunch of tundra cotton on top, beside the safe. This actually upgrades both the main reception area on the second floor and the private dining room on the top floor. In the reception area, the low table and two chairs, stool, set of shelves, two narrow tables and wooden bench have all been upgraded. The shelves now hold a bowl of void salts, two bottles of frostbite venom, a deathbell flower, potion of haggling, bowl of glow dust and two samples of slaughterfish scales. On the low table is a plate of bread and cheese with a bottle of wine and tomato beside it. One of the narrow tables is now a small cupboard with a small table beside it with a platter of two sweet rolls, two boiled creme treats, and two red apples. A large vase containing a juniper tree has been added. Around by the porch entrance the narrow table has been upgraded and now has a copy of Thief of Virtue on top with a wall shelf above holding a potion of health, and copies of The Talos Mistake and Olaf and the Dragon. Two more large vases added, one by the porch entrance and the other by the stairs down to the basement, both contain snowberry bushes. Both flights of stairs have been cleared of all crates, barrels, etc. There is now a large vase halfway up the stairs to the top floor containing another snowberry bush. Upstairs the table and chairs in the middle of the room have been upgraded. All the stacks of crates have been removed and two sets of shelves, a two-shelf bookcase, a small cupboard and wooden bench have been added around the room. On the sets of shelves are two baskets; one contains a bunch of tundra cotton and the other two bunches of lavender, a deathbell flower, another bunch of tundra cotton, copies of Lost Legends, Biography of Barenziah, v3, The Cake and The Diamond, a draught of strength, potion of health, and a potion of regeneration. On the small cupboard is a drum, flute, and potion of health. On the table in the middle of the room is a bottle of spiced wine and a potion of regeneration. † Item of random strength. This upgrade clears out the alcove by the bottom of the stairs and the area that contained the practice dummies. In the alcove the set of shelves and cupboard are removed although the bottles of mead and wine remain. A smaller unit holds three small mead barrels. The food barrel with eight iron ingots on top remain and along the back wall are a row of five weapon racks with the middle one holding an iron sword. In the larger area two mannequins replace the practice dummies. There is an arcane enchanter installed in the corner with two shield plaques above, one on each wall, both hold an iron shield with crossed iron greatswords. There is an open crate containing a filled common and a filled petty soul gems. Behind this is a gem stand holding an empty lesser soul gem. To the left of these are two weapon plaques on the wall. There is a two-shelf bookcase with a wall shelf over it. On the shelf is an empty grand and an empty lesser soul gem. Once this is purchased all the crates and barrels are cleared and a small square empty wooden table and two chairs, a large planter and a wooden bench are installed around the entrance. It is an upgrade that may be worth NOT purchasing. Purchasing this upgrade improves the quality of the existing furniture, adds a bowl of bread and plate with a sliced eidar cheese on top of the narrow table and a bottle of alto wine on the wall shelf above. Adds a fireplace with a cooking pot on a stand in front and a joint of raw beef and a cabbage in a cast iron pot on the floor. It adds a small cupboard with an open crate on top containing four tomatoes and above this on the wall shelf it adds a potion of plentiful healing, a small unit holding an empty wine bottle, a two-shelf bookcase, a small round table beside main table with bread and cheese on top. This upgrade adds a new room to the existing house, on the top floor just outside the master bedroom it adds a door into a bedroom containing two children's beds coming out from the southwest wall with long unlocked chests at the foot of the beds, a small unit between the beds holds a blue and an orange dartwing, a grass pod, a bunch of lavender, a bowl containing three purple mountain flowers and seven red mountain flowers, a pearl, an apothecary's satchel, copies of Pirate King of the Abecean, Walking the World, Vol XI, and A Children's Anuad. To the left of the beds is a small round table with a blue butterfly wing and a sweet roll on a plate with a lute leaning against the wall beside it. To the right of the beds is another small round table with a flute on top and beside this is a large map of Skyrim on a stand. There is a long wooden table and bench against the southeast wall with a platter holding a honey nut treat, a boiled creme treat and a long taffy treat, a red and a green apple. Against the northeast wall is a tall wardrobe, a wash basin, a child's practice dummy, an unlocked wooden chest containing minor loot with a wall shelf above holding a drum, some charcoal, copies of Cats of Skyrim, and Yellow Book of Riddles and a flute. This upgrade also removes two of the sets of shelves from the private dining room to accommodate the door. It will also remove the items on the shelves: two baskets; one contains a bunch of tundra cotton and the other two bunches of lavender, a deathbell flower, another bunch of tundra cotton, copies of Lost Legends, Biography of Barenziah, v3, The Cake and The Diamond, draught of strength, potion of health, and a potion of regeneration. So it is worth collecting these items prior to purchasing this upgrade. 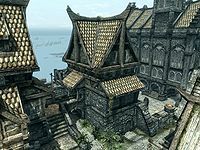 The quest objective "Visit Proudspire Manor, your new home" will not be completed unless you enter through the side door, up the stairs, opposite the entrance to Vittoria Vici's House. Any other door, and the quest objective will not update, so be sure to follow your map marker. Oddly enough, there are no apparent downsides to using the manor as a home without officially buying it but instead using the stolen Fletcher's key to open the back door. Sleeping in the bed inside gives a well-rested bonus, and all containers are safe for storage. Once a housecarl moves into the manor, the basement bedroom should be refurnished to include a small one-person bed. A spouse living in Proudspire Manor will sometimes prefer to sleep on the housecarl's bed roll rather than the bed in your master bedroom. A fix for this on the PC via console is to use the command prid e2735 and markfordelete, then exit the house and enter again. The bedroll will be gone and the spouse will sleep in the right bed. Very well, love. This is a beautiful house, and Solitude is so safe, so diverse. It's a wonderful place to raise a child. Oh, fine. So many guards on the street here, I hardly have to worry. If you try to put too many books in a bookcase they will disappear and you will no longer be able to access that bookcase. Proudspire Manor can be entered through the patio door using the Solitude Fletcher's key, so the manor does not need to be purchased to obtain its unusual gem. The housecarl's bedroom in the basement will not be furnished after you are made thane. You can use the following console commands to fix the issue: prid e25d4 followed by enable. If two boxes on the right of the room do not disappear (partly overlapping a chair), you can use the following console commands prid e273a followed by disable. Rugs below the living room and the second floor tables will not appear despite purchasing the living room furnishings. You can use the following console commands to fix the issue: prid e25d7 followed by enable. After installing Hearthfire, the cooking pot in the kitchen disappears and the barrel under the stairs may be missing. After purchasing the child's bedroom, its door may not appear making it inaccessible. You can use the following console commands to fix the issue: prid xx00418a followed by disable. Alternatively, it's sometimes caused by the section of the wall that used to be there not disabling when the door is put in. Use prid d89eb followed by disable to disable this wall section. The side door onto the balcony cannot be opened even if you have the house key. ? Jordis has the key to the door. Completing the Thane of Haafingar quest will unlock it. It can also be fixed using the console command unlock with the door selected. Entering the house via the back door to the basement will not clear the objective Visit Proudspire Manor, your new home. Enter the house through the main entrance (up the stairs) to clear the objective. Your spouse might not sleep upstairs in the master bedroom. Instead, they will sleep in the bedroll in the basement. However, you will still receive the Lover's Comfort and Mother's/Father's Love bonuses if you go to sleep when your spouse and children do. It is possible that the cooking pot may not spawn correctly, making it impossible to cook foods in this house. If you have purchased Proudspire Manor and placed armor on the mannequins prior to the Battle For Solitude quest, the armor may have disappeared permanently if you enter the house during the battle. ? This page was last modified on 6 February 2018, at 05:15.